Hi Friends! 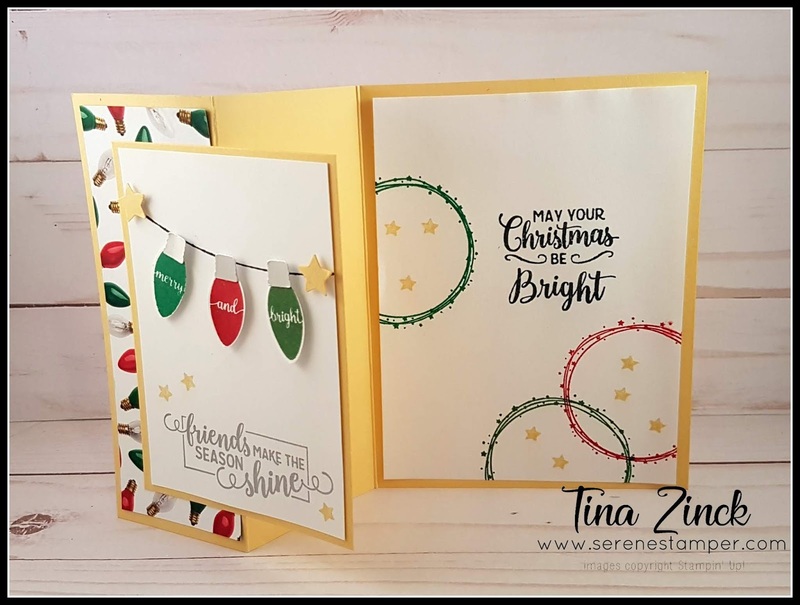 Here is card #3 of five from our weekend retreat mini class! 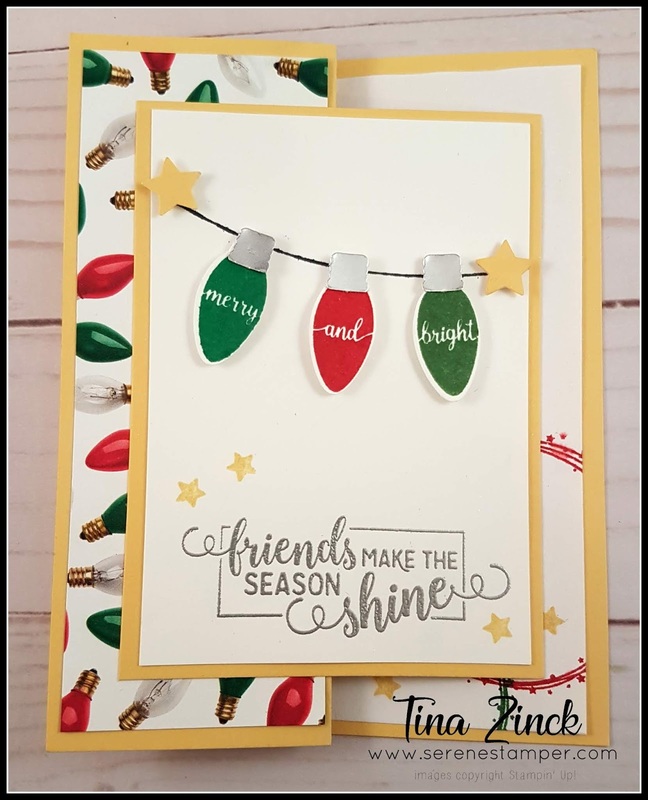 The "Making Christmas Bright" bundle wasn't honestly one of my favourite new products from the Holiday catalogue but once I started playing with it I fell in love! So adorable, tons you can do with it and that coordinating punch is awesome. I hope you enjoy today's card! Fold 8 1/2" x 5 1/2" So Saffron card stock in half to create card base. Fold front of card in half, towards the crease. Glue 1 7/8" x 5 1/4" strip of "All is Bright" (with light bulb pattern) to the folded over panel. Cut a piece of So Saffron card stock to measure 4 1/2" x 3 1/4" and a piece of Whisper White 4 1/4" x 3". 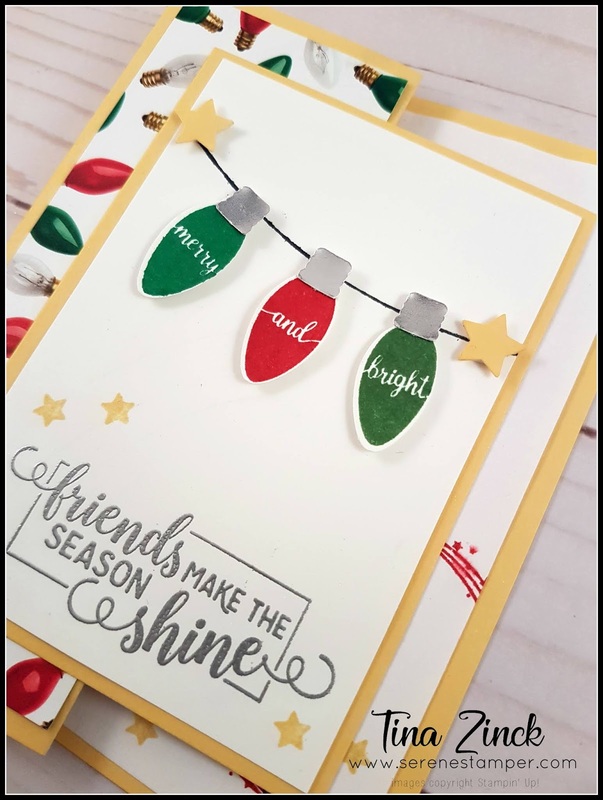 Stamp sentiment on bottom of Whisper White with Versamark and emboss with Silver powder. Stamp three stars with So Saffron ink. Stamp 'string' image with Memento along the top. On scrap paper stamp three Christmas lights, one in Real Red, one with Garden Green and one with Call Me Clover ink and cut with coordinating punch. Apply to card with Stampin' Dimensionals. Cut three top bits of the light bulb with same punch, using Silver Foil paper and glue to lights. Punch two stars from Twinkle Builder Punch from So Saffron card stock and apply to each end of string with mini stampin' dimensional. Glue the Whisper White layer to the So Saffron layer. Apply more adhesive to the left side and glue to front panel, as shown on card sample. Cut Whisper White card stock (or computer paper, as I used) for the inside of card 4" x 5 1/4". 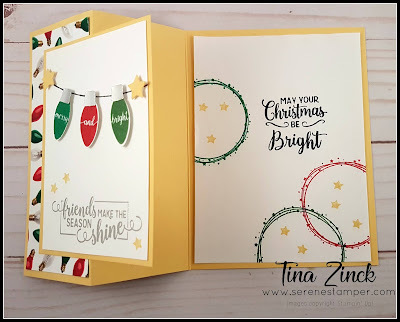 Stamp sentiment with Black Memento and decorate the inside as desired.